Although international development discourse considers the state as a crucial development actor, there remains a significant discrepancy between the official norms of the state and public services and the actual practices of political elites and civil servants. 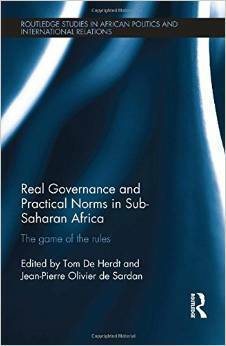 This text interrogates the variety of ways in which state policies and legal norms have been translated into the set of practical norms which make up real governance in sub-Saharan Africa. It argues that the concept of practical norms is an appropriate tool for an ethnographic investigation of public bureaucracies, interactions between civil servants and users, and the daily functioning of the state in Africa. It demonstrates that practical norms are usually different from official norms, complementing, bypassing and even contradicting them. In addition, it explores the positive and negative effects of different aspects of this ‘real governance’. This text will be of key interest to academics, students and researchers in the fields of development, political science, anthropology and development studies, African studies, international comparative studies, implementation studies, and public policy.